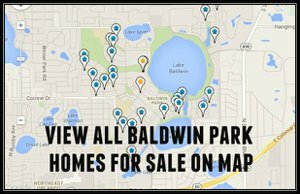 Baldwin Park is an 1,100 acre neo-traditional community built on the former site of the Orlando Naval Training Center, just three miles northeast of downtown Orlando. Featuring newer homes inspired by the past, Baldwin Park is home to over 8,000 residents and 125 businesses. Click on the blue button to view all Baldwin Park homes for sale. To view all homes sold in Baldwin Park in the last year, click here or on the photo to the left. A downtown-type village center, wide sidewalks, miles of bike paths, trails around the lakes, and numerous parks and recreation facilities, all encourage Baldwin Park residents to get out and about. A-rated schools, a variety of housing styles including single family homes, townhomes, even office space with residences above, make Baldwin Park one of Central Florida's most desirable communities.